The common accessory of the Victorian gentleman was a cane, walking stick, or umbrella. With the improvement of metallurgy and precision firearms came the development of cane guns. Many were crafted during the late percussion era (1840-70), but most are from the early cartridge era (late 1850) and onwards. Often referred to as poacher’s guns, the high cost of these “canes” put them far beyond the reach of common people, and were instead carried by the wealthy, who may have used them for occasional opportunistic hunting. However, as with swordsticks and blades hidden within umbrellas (and parasols for the ladies), the cane guns served as deadly concealed weapons for a gentleman who didn’t want to carry a pistol within his jacket, or the scoundrel who desired an element of surprise at his side. Remington Rifle Cane, available in .22 and .32 calibre, patented 1858. Most were made post American Civil War. The percussion era models usually fired a large calibre pistol round, and were loaded in the same fashion as contemporary weapons: with a charge of gunpowder, then a ball and wading, and a percussion cap. Nearly all the surviving examples of cartridge firing cane guns are rimfire¹ weapons built for small calibres (.22 to .35) but there were limited numbers of shotgun versions produced with centre fire shells. Percussion and rimfire versions were crafted with smooth and rifled barrels, but of course the shotgun models were all smooth bore. 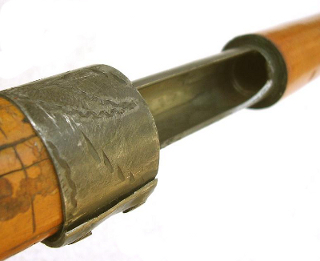 Dumonthier walking stick 410 shotgun, first patented in 1876. This example has a nice stag horn handle. Joseph-Célestin Dumonthier was a French gunsmith and inventor who produced shotgun walking sticks that were known for safe operation and reliability. His weapons included a safety catch to prevent accidental discharge; a feature required on all modern firearms. The stopping power of his cane gun would have been formidable at close range in a London or Parisian alley. Reloading was quite quick, accomplished by a twist and pull of the shaft, the spent cartridge pulled free and replaced with a fresh shell. Later models included an ejector lever to pop spent cartridges out. 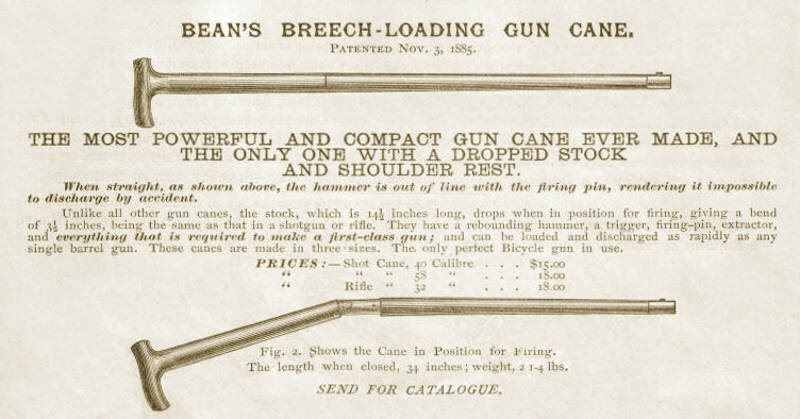 Bean’s Gun Cane, 1885, available as .40 and .58 shotgun, and .32 calibre rifle, priced at $15 and $18. As the 19th century wore on the cane guns improved, and included better design features, however, they were generally single-shot and not very subtle due to loud discharges and the volume of smoke produced. The truly fine (and by far most expensive) cane guns of Victorian times were pneumatic. The handle and upper portion of the cane served as an air tank, filled with a hand pump, providing a muzzle velocity between 650 to 1,000 feet per second (200 to 300 metres). The discharges were relatively quiet, and no tell-tale smoke to indicate the source when a surreptitious shot was desired. 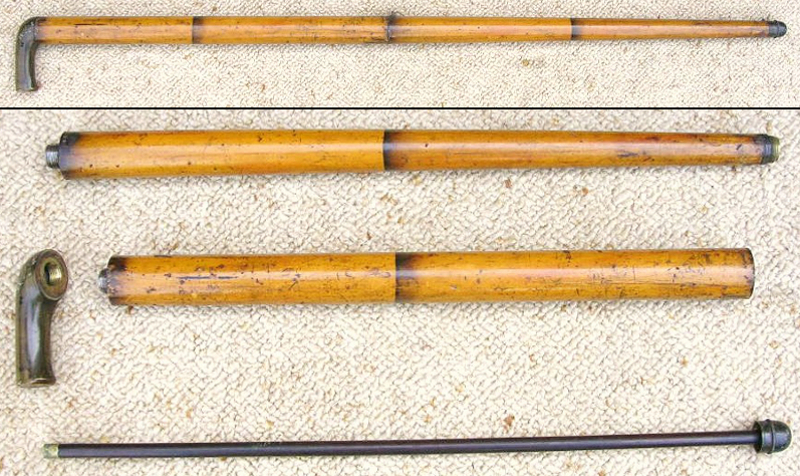 Examples of air gun canes in original cases. A Reilly on the left, a Blisset on the right, both of London, circa 1850-66. Blisset “bamboo” air cane, shown complete at the top and disassembled. The faux horn handle and top portion of the shaft make up a hollow metal tank for the compressed air. It’s easy to imagine Victorian covert operatives using such canes and walking sticks as they carried out their secret missions. 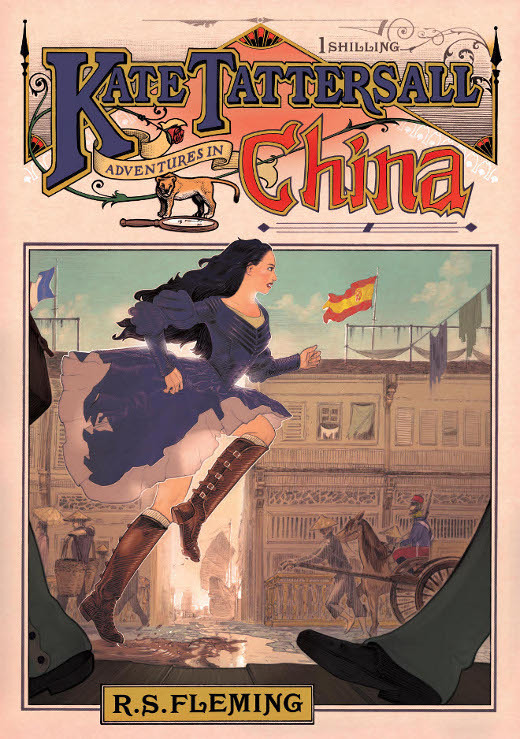 Kate Tattersall dealt with such guns on several occasions, and learned to identify even the most cleverly disguised versions. Not one to carry a cane herself, she liked umbrellas and parasols, but didn’t care for the weight associated with the installation of a gun. She handled a vast array of concealed weapons, but those will be covered in another article. A small calibre pepperbox pistol (4 shot) and spike blade. This would have been a lighter alternative to the long cane guns, but less accurate; better for very close quarters. ¹Rimfire cartridges have a percussion cap housed within the entire base of the shell, allowing the impact of the hammer or firing pin to spark the propellant and discharge the weapon. Hola! I’ve been following your blog for a long time now and just wanted to say keep up the good work! Post more about weapons! Thank you for another excellent post. I have a presentation next week, and I am on the search for such information. Now where can I find a working model of one of these? 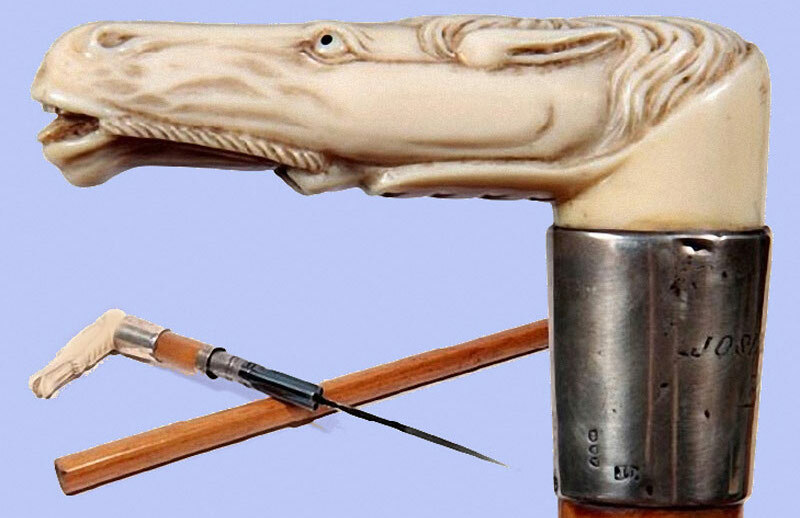 @Cerberus, these canes come up for auction and are available at antique weapon sales. As a concealed weapon, there are restrictions to owning a working model. I have several including a Lawings 36 cal cane gun (1979). It fires a 36 cal lead shot using black powder or pyrodex. Youtube shows my gun shot by 2 women. It has shotgun ability loading 8 ’32’ lead shot for a real wallop. Legal in 47 states with no ‘paper’. People won’t buy cane guns even if legal. I remember when the modern Lawing cane gun was introduced for sale in USA for $80 in 1980. Great product I bought two but couldn’t give it away 10 yrs later. Why I have no idea. Lawings went out of business. Even though well made and legal. I carried mine in NYC for 10 yrs.